In this blog, I am providing steps to report ‘Online or Digital Media’ PDUs under Education category. 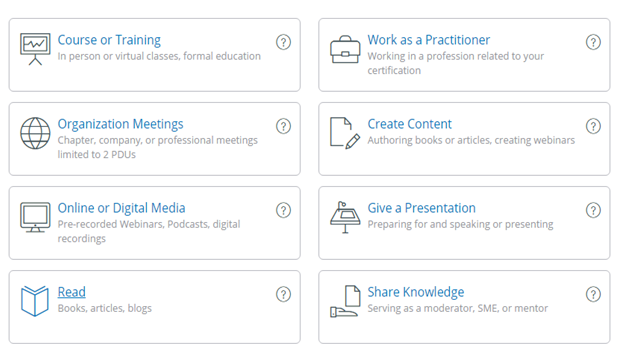 Online and Digital Media is the most interesting category and includes self-paced learnings through pre-recorded webinars, podcasts, and digital media. Note: You can earn all of your PDUs using ‘Online and Digital category 🙂 . If you like watching pre-recorded videos or participating in webinars, this could be your favorite way to maintain your certificate. Login at pmi.org using your user id and password. Fill details of Provider, Title, Date Started and Date Completed. 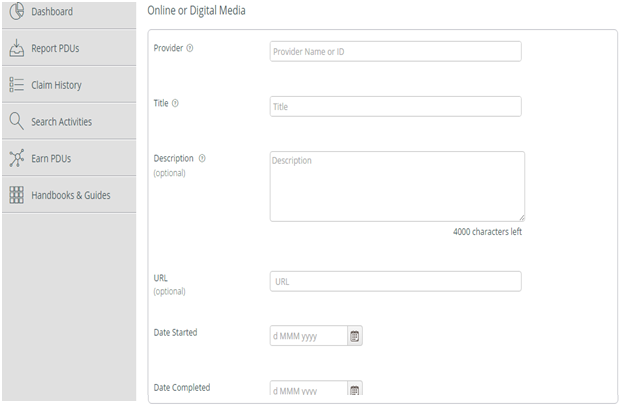 Provider and Title details will come from the source of your digital or online content. If you are watching any video from iZenBridge YouTube channel, in this case provider will be “iZenBridge” and the Title will be the name of video. The provider of your online or digital media can be any PMI REP (Registered Education Provider), or it may be any third-party. Description and URL of online media are optional details. When you scroll in the same screen, you are also required to fill the number of PDUs for the relevant category of Talent Triangle. You are required to divide the PDUs among Technical, Leadership, and Strategic PDUs. And the division will depend on the content of pre-recorded videos or webinars. You can count 1 PDU for each hour of watching online or digital content. 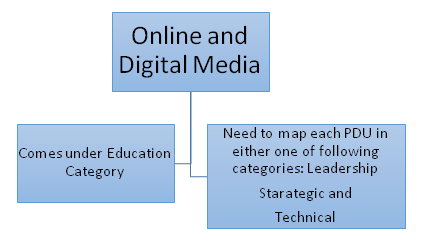 You may find that online or digital content belongs to all three categories, or it may fit only one/ two categories. Click on “I agree this claim is accurate” and Submit your PDUs claim. Thanks Saket. i submitted and reported all and its approved. Thank you. I am trying to report PDU’s under the online and digital by going through our link – https://youtu.be/4ErD5UHzAHI?list=PLWcvFkRbuunnbTh2q_zstxJAHrT70H2FD. As few videos are for 42/51/52/57/55 Minutes, can you tell me if i can use this to report 0.75 or 1 PDU and 28 minutes as .5 PDU? Also for 10-10 mints videos how can i report the PDU’s?